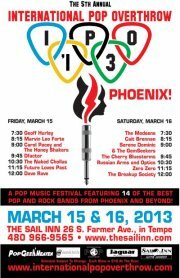 The International Pop Overthrow Phoenix!!! Many years ago, when I was coming to terms with my musical illness and my compulsion to write about everything I heard that turned me on, I was just starting to get published outside the realm of my college newspaper, underground publications and philosophy magazines. When I began writing, I had never intended to become a music journalist of any sort–I was way into politics and social issues, but as time would have it, the two loves of my life became entwined and when my writing started to concern the music I loved there was no stopping it. It also seemed to cause more positive change than any of my socio-political rants ever had, so I stuck with what I knew. Around this same time I became aware of a writer named David Bash who, like myself, seemed to be possessed by an addiction to sound, pledged his ear to the obscure, the eclectic and esoteric and also boasted a record collection larger than my own. It was a time when I was really digging into “Power Pop”, “Britpop” and pretty much anything that was defined or performed by Brian Wilson/Mid-Period Beatles/Big Star and the like. I was even on the “Audities” mail list which Bash was a part of and through it discovered amazing artists like The Wondermints, Splitsville, Jason Falkner, Dwight Twilley, The Records and far too many to name. The thing I noted, what I took to heart, what really impressed me about Bash was that nearly everything I read by him about the bands he chose to write about was overwhelmingly positive. Now, I had been writing overwhelmingly positive reviews about bands for years, but my reviews weren’t always honest–in his writing I discovered positivity as well as honesty and authenticity. I didn’t realize this until a few weeks ago when Bash contacted me about this weekends amazing event how much he had influenced my writing about music. After a brief conversation, I realized that what I do in Arizona currently stems from an ethic that I garnered directly from reading his reviews and insights–I only write about music I like, I am always searching for new things, I am always challenging myself to like things that at first put me off and I refuse to be negative about the music I am investing my soul into. Someone recently referred to me as “The Lester Bangs of Phoenix” which is one of the highest compliments I can imagine and not completely inaccurate, but if someone referred to me as the “The David Bash of Phoenix,” well that would be just a level that’s a little bit higher. Since 1998 Bash has been holding festivals to celebrate the music he loves, often relying almost completely on unsigned, brilliant bands local to the cities in which he holds his International Pop Ovethrow events. 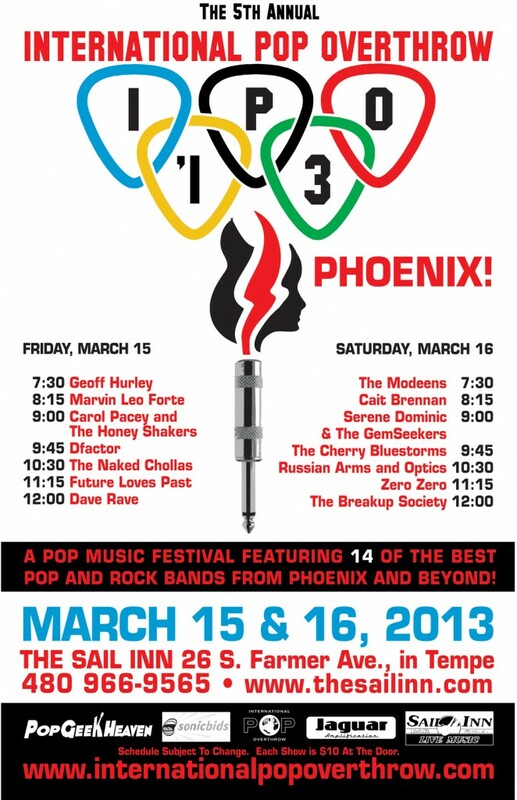 This weekend, David Bash is bringing his annual International Pop Overthrow to Phoenix for the fifth time and it’s going to be one hell of a two day event held at the Sail Inn this Friday and Saturday night. I was saddened when I missed last years IPO, but these things seem to sneak up on me like a ninja, I had promoted one night of the show before I even knew that it was associated with the International Pop Overthrow–in fact I didn’t even know that IPO was happening until both David Bash and Cait Brennan hit me up within 24 hours of each other. I had planned to go to SXSW this week, but between a health scare and the realization of what was happening in our own backyard, I decided to save my money, dig in for the weekend and just enjoy the hell out of this. I would advise you do the same thing. The amazing aspect of this festival is that it is almost entirely local (Dave Rave and The Cherry Bluestorms aside) and that there is actually a fair share of bands here that I’ve never heard or heard of or at the very least seen live. This is what I look forward to the most, because I have a feeling that at least three of these bands will force me to write about them through sheer brilliance, I have my predictions, but we’ll see what happens. We should just be pleased that we are one of the 16 cities in the world that gets to enjoy this unique festival and relish in it. For myself, I know what I can look forward to in the acts I’ve seen before or practically lived with mentally. They don’t know it, but I snuck into the Yucca one night after the radio show and caught Carol Pacey and The Honey Shakers and I was pretty impressed with their alt.country/Americana act, enough to ask a complete stranger “Was that Carol Pacey?” Dfactor has been sending me songs for some time and they keep getting better and better, the most recent will be featured soon, somewhere near you. Future Loves Past is one of my five favorite bands in Arizona and the whole damn world and I imagine they are going to set the crowd on fire Friday night. Cait Brennan is an amazing musician and it turns out, also a formidable writer, Saturday night we get to see her with a full band! Russian Arms & Optics are one of my new favorites on the scene and by favorites, I mean I completely love them, this will also be my first time seeing them live! Zero Zero…ummm, do I need to say anything, really? Well, for those who haven’t read anything I’ve written before, this trio of awesomeness literally sends me to the stratosphere on a regular basis, whether they are blowing my mind completely in a searing live performance or in my endless listens to their debut album–if MAYDAY was a vinyl release I would have to purchase a new copy soon because the grooves would be worn out on my first. So that’s who and what I know…sure, I’ve been stalking Break Up Society for a while, but I haven’t had a chance to catch them live yet, Dave Rave is a freaking legend, as are The Naked Chollas, locally speaking and everything I’ve read about everyone else, makes this entire event sound like one very attractive weekend for my ears to enjoy. If you’re looking for something to do this weekend, you didn’t head East to Austin and you want to get into something wonderful and weird, why not join me at the Sail Inn and find yourself a fantastic time with the International Pop Overthrow. Both shows are $10, at the door. The Sail Inn is located at 26 S. Farmer Ave, in Tempe. They can be reached at 480 966-9565, and their website is http://www.thesailinn.com/. They are a 21+ Venue. International Pop Overthrow (or IPO, as it has affectionately become known) is a pop music festival which has been held for the past fourteen years in Los Angeles. We have also held IPO for various years in Chicago, New York, Boston, San Diego, Phoenix, Detroit, Milwaukee, Portland, Seattle, Austin, Dallas, Vancouver, and Toronto, as well as in Liverpool (at the world famous Cavern Club), and London, UK! We are greatly looking forward to all of the IPO shows in 2013! The purpose of International Pop Overthrow is two-fold: one aim is to give every worthy band who’d like to play their music in a festival atmosphere the chance to do so, and the other is to bring pop music the attention it so richly deserves. We have made great strides to that end, garnering press in several noteworthy papers in each city in which we hold the festival, and creating a very positive buzz about pop music within the inner circles of major labels. We’re looking forward to the very real possibility that a number of bands who have played IPO will grab the brass ring and receive major label deals. The IPO website will be constantly updated as event particulars develop and change. Please make sure to check the site regularly. All you need do is ask anyone who ventured from near and far to come to IPO if they found the trip worthwhile, and we think you’ll be convinced that International Pop Overthrow is an event that you won’t want to miss!